Now that GROMACS has been ported to OpenCL, we would like you to help us to make it better. Why? It is very important we get more projects ported to OpenCL, to get more critical mass. If we only used our spare resources, we can port one project per year. So the deal is, that we do the heavy lifting and with your help get all the last issues covered. Understand we did the port using our own resources, as everybody was waiting for others to take a big step forward. The below steps will take no more than 30 minutes. -DGMX_MPI=on to build using an MPI wrapper compiler. Needed for multi-GPU. It’s very important you use the options GMX_GPU and GMX_USE_OPENCL. See this article on the Gromacs website. In all cases, it is very important you turn on GMX_GPU and GMX_USE_OPENCL. 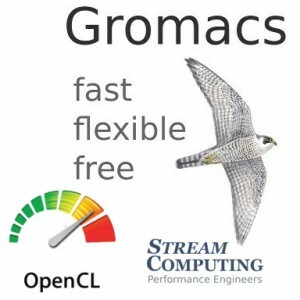 Also the wiki of the Gromacs OpenCL project has lots of extra information. Be sure to check them, if you want to do more than just the below benchmarks. Let’s torture GPUs! You need to do a few preparations first. This experiment is called “NADP-DEPENDENT ALCOHOL DEHYDROGENASE in water”. Download “ADH_bench_systems.tar.gz” from ftp://ftp.gromacs.org/pub/benchmarks. Unpack it in build/bin. If you want to run from the first GPU only, add “-gpu_id 0” as a parameter of mdrun. This is handy if you want to benchmark a specific GPU. If you have your own experiments, ofcourse test them on your AMD devices. Let us know how they perform on “adh_cubic_vsites”! Understand that Gromacs was optimised for NVidia hardware, and we needed to reverse a lot of specific optimisations for good performance on AMD. We welcome you to solve or report an issue. We are now working on optimisations, which are the most interesting tasks of a porting job. All feedback and help is really appreciated. Do you have any question? Just ask them in the comments below, and we’ll help you on your way.